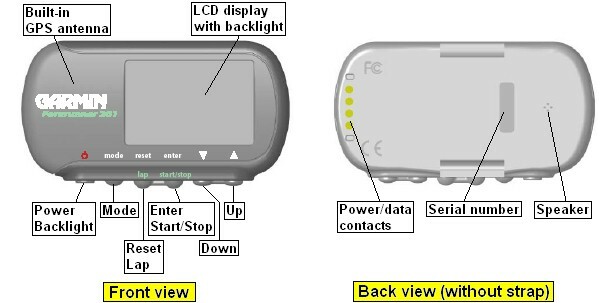 Small wrist top GPS receiver with easy to read display and serial interface. As a personal training assistant, the GARMIN Forerunner 201 records the travelled path (track), distance, time and pace/speed, computes the calories burned and helps to achieve your personal workout goals. The device is very easy to use, supports multiple languages and has an extremely sensitive antenna. It is the perfect partner for any outdoor activities. The built-in serial interface supports data exchange with a PC. The Forerunner 201 is especially well suited to provide information about your outdoor activities (track, speed, maximum speed, distance, elevation profile, time a.s.o.). Use the function "mark waypoint" to get the coordinates of the current location. The device also shows the current location in relation to user defined waypoints. 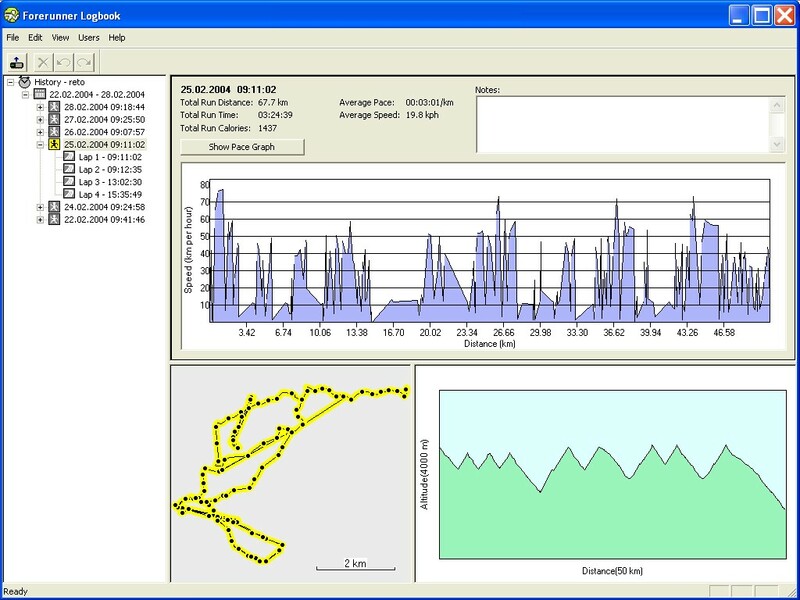 Profile: stores personal information such as weight (in order to calculate the calories burned) and the various speeds for walking, speed walking, jogging, running and sprinting. Stop watch with split times (laps). Record split times either manually by pressing the "lap" key or automatically based on a user defined distance. Speed alert: Goes off when the current speed exceeds a user defined upper limit or when the current speed drops below a user defined lower limit. Distance & Time: Set the distance for your workout and the time you intend to achieve. Forerunner computes the pace / speed required. Time & Pace / Speed: Set the time and the pace / speed for your workout. Distance & Pace / Speed: Set the distance and the pace / speed for your workout. The virtual partner will keep exactly the pace / speed required to achieve the goal you have set. Forerunner will constantly measure your current pace / speed and compares it to the virtual partner's pace / speed. It will ask you to speed up or slow down as needed and it shows on the display whether you are ahead or behind your virtual partner. History: Forerunner keeps track of your workouts. 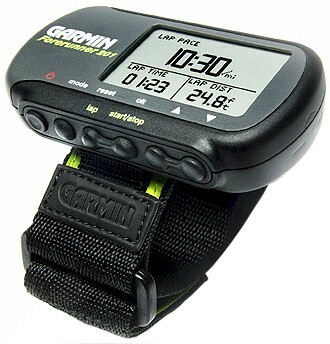 It stores the date, time, number of laps, duration, distance, average speed and the calories burned on a daily basis. It also provides weekly overviews and running totals for the duration, distance and calories burned. Navigation: Indicates your current location in relation to user defined waypoints. One waypoint may be set as the final destination, Forerunner will show distance and direction to the destination. Use the "mark waypoint" feature to find the coordinates of your current location. Back to start: This feature helps you to travel all the way back to the starting point of your trip. Stores up to 100 waypoints with name (up to 6 characters), icon (choice of 29 symbols), coordinates and elevation. Stores up to 3'000 trackpoints of the most recent travelled path (tracking) and 5'000 laps. User management: Supports multiple Forerunner devices. Data exchange: Supports archiving and analysis of data collected with Forerunner devices. Note: The data displayed here was collected while downhill skiing. This model has been discontinued; however, you can still order options for the Forerunner 201. All options for the GARMIN Forerunner 201 in detail. Here we provide additional documentation and software updates related to the Forerunner 201.